Britain: Are Times’ Journalists Ignorant of John McDonnell’s Work and Cross-Party Alliances, Economical with the Truth, or under Orders? The Times’ description on Saturday 19th September: ‘universally unpopular’, having ‘strained relations’ with unions, ‘abrupt’ and dismissive’. Not so, he has many friends, co-operative colleagues in all parties and admirers in this country and the United States. And though his versatility is shown in his inspiring and wide-ranging book,‘Another World is Possible: a manifesto for 21st century socialism’, a challenge to New Labour, putting forward a set of attractive new ideas, principles and policies, his most sustained work has been directed towards peace-building – and without peace there can be no real prosperity for the 99%. He will – of course – be anathema to party–funding arms manufacturers, arms traders and the politicians who need their cash and non-executive directorships, because of the following activities. In 2003 he was inspired by Congressman Dennis Kucinich of Ohio who was calling for a Cabinet-level Department of Peace within the Executive Branch of the US Government. His bill to create a U.S. Department of Peace was repeatedly reintroduced in each session of Congress, attracting 72 cross-party co-sponsors. This work was later carried forward by the Peace Alliance. This ‘unpopular man’ was heartily welcomed in the States where city councils across the country welcomed the practical impact a Department of Peace would have on reducing violence in their nation and abroad. 18 cities -representing a collective population of over 6.5 million people – had endorsed it at the time of writing. They included Atlanta, Chicago, Cleveland, Detroit, Minneapolis, Oakland, San Jose and more. 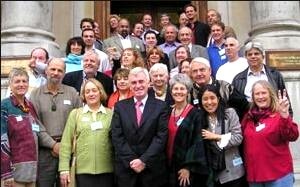 John McDonnell advocated a ministry for the promotion of peace in all areas of life from the “playground to the Government” to embrace education/conflict resolution within business, prisons, homes, the media and the whole of life. He pointed out that this would be in line with developments in the USA and Europe, adding that Gordon Brown had set aside £500m in a “united Govt approach to reduce conflict in society and specifically to promote conflict resolution”. Ministry for Peace meetings often attracted 70 & 80 people from peace organisations, lawyers and individuals committed to the idea – despite his ‘abrupt’ and dismissive’ behaviour? Unlikely. John McDonnell introduced a Ten Minute Bill, the Ministry for Peace (Interim Provisions) Bill, passed unopposed on Tuesday 14th October, 2003. A second reading is planned for 21 November. The Bill’s second reading was passed unopposed but it was unable to go through all its parliamentary stages before the end of the session in November. 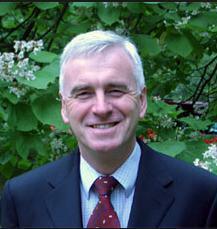 The other cross-party sponsors joining the less than ‘universally unpopular’ John McDonnell were the much-missed Elfyn Llwyd – Plaid Cymru, Jeremy Corbyn – Lab, Alex Salmond – SNP, John Randall – Con, Rudi Vis – Lab and the excellent also-missed Alan Simpson – Lab, who has become a great asset to the environmental movement. This holds meetings such as a series of three with young Israelis and Palestinians who presented their visions and aspirations for changes they wished to see in the region during the next 20 years. The APPG provides a forum for dialogue between Parliamentarians, Her Majesty’s Government and civil society on alternative methods of preventing and resolving violent conflict, on the basis of expert information and opinion from across the political spectrum, in dialogue with officials from the Department for International Development, the Foreign and Commonwealth Office and the Ministry of Defence, as well as various conflict NGOs, academics, members of the business community and the media. The Group currently consists of twentynamed members from both Houses of Parliament. Others in the new Parliament who express support or interest will be added to this list.